Most of the roofing companies Rockwall Tx uses are over- booked and unable to help you with your roofing needs any time soon. 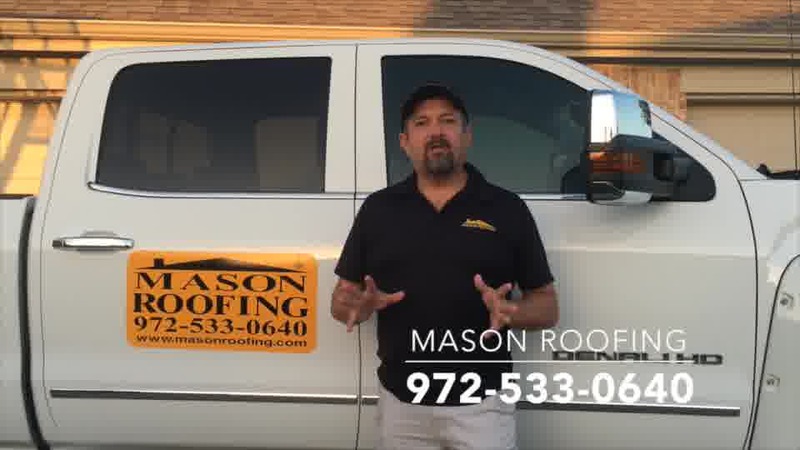 Not so with Mason Roofing. We will take care of all your needs in a timely and efficient manner. We care about our customers, and will treat you like family. You may not realize that you have roof damage, so after a round of storms like our recent ones in the Rockwall area, it is a good idea to have your roof checked by a professional. In this video, Paul Mason, owner of Mason roofing, tells you how to access the damage yourself. You need to have a good, sound roof to protect the value of your home, so either check it out yourself, or give Mason Roofing a call and we will come out and check things out for you, for free! If we find any damage, we will write up free estimate that you can take to your insurance company. Once you have set a date for your insurance adjuster to come out, let us know and we will meet him a your house. Once the insurance allotment is for the damages incurred, we will step in and take it from there. We want to make your life easier and your home fully repaired with no stress on you. Window Screens - Hail will make your screens look like a cat climbed up them streaking them. Window Beading - May have cracks or holes from the hail. Gutters & Downspouts - You will see visible denting on both the gutters and downspouts. Fence - You will have dots in the stain on your fence. Air Conditioner -Dents in the coils, they may need to be combed after a hail storm. Painted Areas - This could be siding, gutters, etc. Of all the roofing companies in Rockwall Tx, we strive to be the best and to provide ultimate customer service. Give us a call and let us help you access whether or not you need our services. We will check your house for other storm damage as well, and will help you through the process of getting everything all fixed up. One less burden on you. We are great at what we do so that you don't have to worry about the details. we can take care of everything for you, so that you don't have to spend time and effort finding and working with multiple contractors.